Statistics Says Death rate extrapolations for the USA (Machinery accidents): 544 per year, 45 per month, 10 per week, 1 per day, 0 per hour, 0 per minute, 0 per second. Note: this extrapolation calculation uses the deaths statistic: 0.2 per 100,000 people died from machinery injury in the US 2001 (National Vital Statistics Report, CDC, 2003). Machines are unavoidable in any kind of industry and It is the prime part and element, which every safety practitioner must be familiar with. As every safety advisers knew that the Engineering controls are most effective compared to the administrative controls like training & Instruction. & Engineering controls are the best option when elimination is not an option. 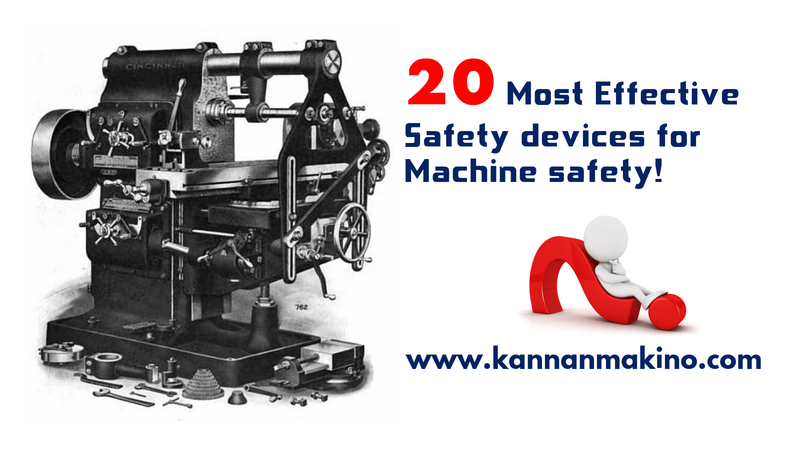 In this post, I have listed you the different safety devices that can be installed to prevent and limit the accidents arising during machine operation. Most of the machines will have three or more safety devices with its self to ensure the safe operations during operation. The Type of safety device will be selected based on the nature of operation & nature of personal interaction with the machine. The Name it self-describes "Fixed", Simply a kind of physical barrier placed permanently with a machinery ( Fixed either by Screws/ weld/ any mechanism) that prevent persons contacting the moving dangerous parts of machinery. The Guard will not move & Could not be removed by the hands, the removal of a guard will require the special tools like spanner or screwdriver etc. Fixed Distance Guard, Is similar to the last type, Instead of enclosing the dangerous parts, the barrier will be placed in a distance permanently, the best example for the fixed distance guard would be a perimeter fence around the robotic area. 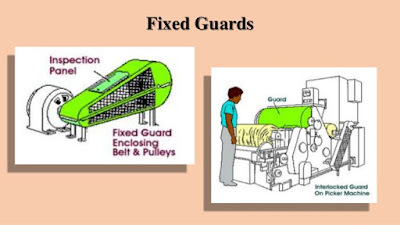 During the machine the guard could not be opened or opening the guard will stop the machine immediately. The "Interlocking Guard with Guard locking" is similar to the "General Interlocking Guards" but the guard needs to be closed & locked in order to start the machine. The Adjustable guards are the option when the dangerous parts of the machinery shall not be fully enclosed due to the nature of operation or any other reasons. Simply, the Size or length or position of the guard shall be adjusted by the operators depending upon the nature of operation and workpiece being machined. 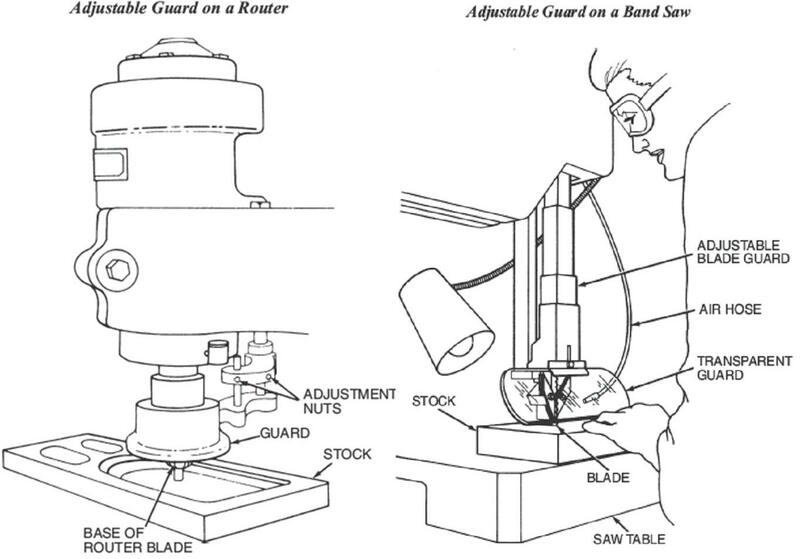 The Adjustable guards are being commonly found in the woodworking machine, milling machine & laths. "Self" describes clearly, that does not require the additional action to change its length/size/position. The Guard will automatically adjust its position depending on the machine operation, the best example for the "Self-adjusting Guard" would be the "lower guard of portable wood cutting machine"
Normally the self-adjusting guards will be connected with the spring / any other mechanism. Two hand operating controls are the safety device that designed to protect the operator's hands, Simply the person needs to continuously operate two controls of the machinery in order to run the machine. Removal of any hand from the control will stop the machine immediately. The machine control needs to be activated continuously in order to operate the machine if the control being released the machine will stop. The Best example would be the portable drilling machine that requires the continuous action till the drilling action completed. 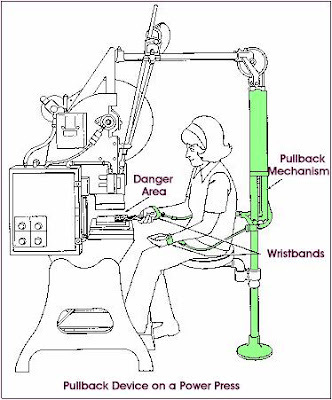 A series of cables attached to the fixed point and the another end connected to operator's hands, wrists or arms that ensure the operator shall not reach the dangerous part of the machine. The Cable will not involve any extension / retracting action. Pull back device similar to the restraint device, but it's linked to the machine motion & It involves extension and retracting actions. A series of cables, that connected to the operator hands, wrists and arms. The another end of cables are mechanically linked to the machinery. 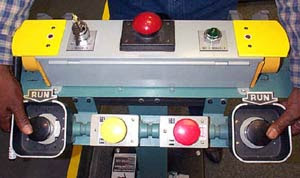 When the machine cycle starts, the operator's hands are automatically removed from the dangerous area. 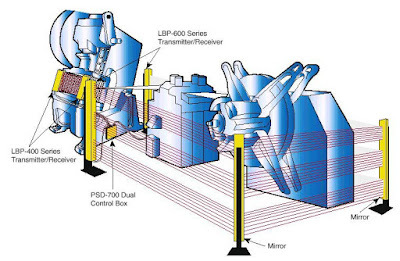 A Device interlocked to the machine control system, that stop the machine operation when the sensing field ( Photoelectric or Radiofrequency ) is disturbed by the machine operator. Simply, A sensor, that continuously sense the dangerous area and stops the machine when the person accesses the dangerous area. A mat interlocked to the machine control, and when the person enters & stands or walks over the mats ( and the predetermined weight/pressure being applied ) the machine will stop. Most suited to the robotic operational areas. The type of safety system, that prevent the trapping of hands/person by the machine parts. Have you ever seen, that the passenger lift doors will retract when you place your hands between during its closing process. Alternatively, Instead of sensing device, a narrow strip is fitted to the sliding doors/machine parts, when the pressure applied by the trapping action, either the movement will stop or the doors will automatically retract. Trip bars are the type of Trip device, that designed like a small bar. 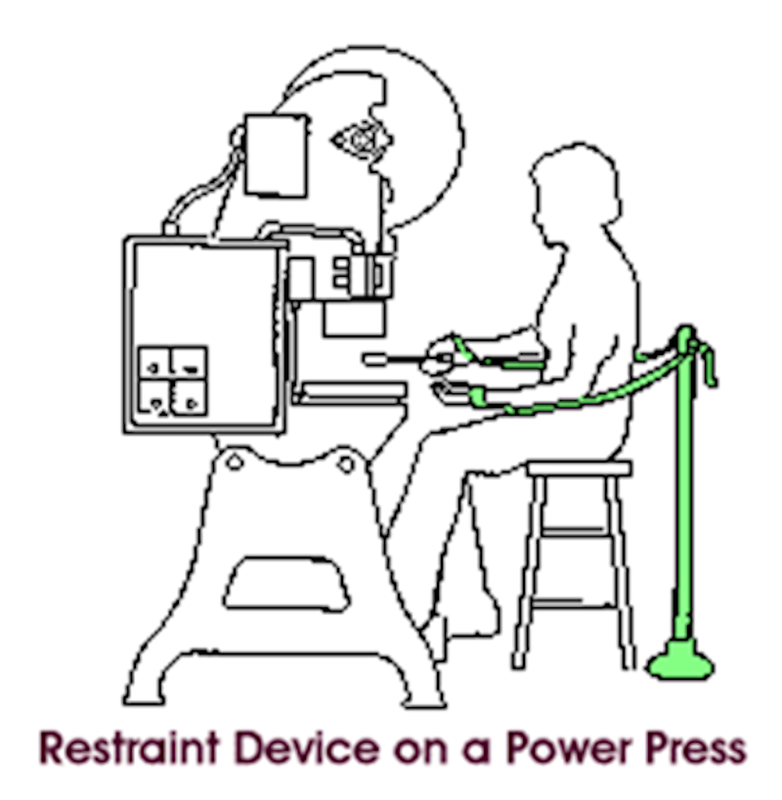 Shall be positioned close to the dangerous part, and when the persons' hands or another part of the body touches the trip bar, the machine will immediately stop. For Example: If the Trip bar positioned close to the radial drill bit, if the person touches the small trip bar during the entanglement, the motion will immediately stop and further injury is protected. Automatic Feeding & Ejection systems are the indirect safety systems, that minimize or eliminates the operators and other personals to keep their hands & other parts of the body in the dangerous areas of the machine during hazardous motion. Work holding devices are the machine parts that designed to hold the work piece during operation, thus remove the need for an operator to place their hands / other parts in hazardous areas. The Most common types would be clamps, jigs & fixtures. An actuation of control, that allows only limited movement of travel/operation. The Movement control may be designed either by point-to-point basis or on the basis of pressure or force. Safe motion device is an advanced version of limited movement control device, that integrates the overall movement of the machine parts. A device that continuously monitors the speed, direction of movements and other parameters as per the safety programs. Most of the machine parts run even after the completion of the process. In that Situation, the Time delay devices would be very much useful. The device, that delays the opening of machine guard, till the hazardous movement of machine parts gets completed. 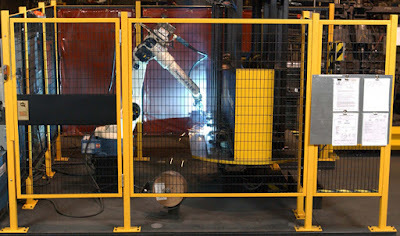 A form of physical barrier that placed between the dangerous parts of the machinery and the person , without totally preventing the hazardous zone. It can be a partial barrier / Low barrier or any other physical barrier. A type of push button / Pull rope, that brings the machine to a safe condition after immediate activation by the person. The main disadvantage is that will only be activated after recognizing the incident / hazardous situation and also It will not prevent/detect the employee exposure to machine hazards. The Safety Devices are effective than administrative controls & PPE. Trip bars & safety edges are works by detecting the pressure applied by either trip/entanglement. 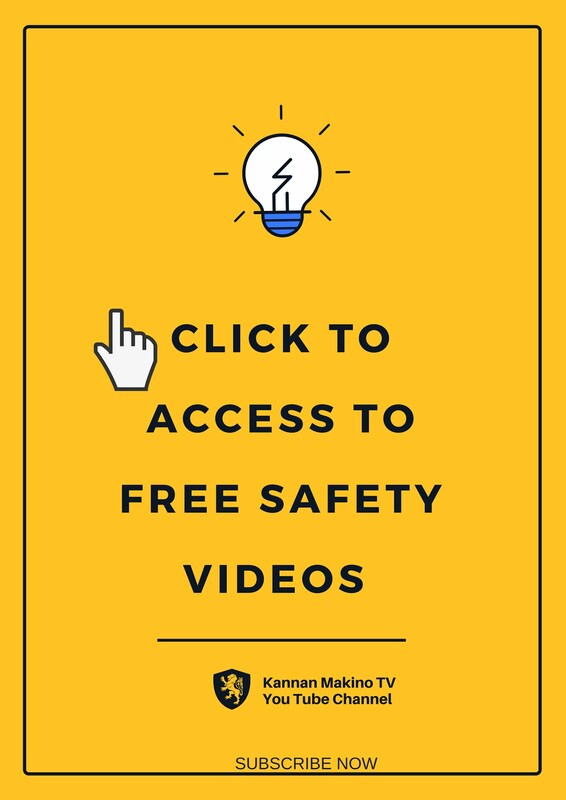 Let's Comment your Opinions & feedback about the safety devices & machine safety! Our experience is that Safety Edges and Mats are very cost effective and they don´t chain the workers to the machine like restraint devices. I really like the pictures you´re using. Where do you source them? Would like to use some in a ppt to my execs. Yeah You are right. It is Important to select the right safety device for machineries, We can't use any one of the blindly. We have to select the right machine safety device with due consideration to number of factors such as nature of operation, the way of interaction with machinery, and the level of risk minimization that can be achieved etc. Thank You for showing Your Opinions on my blog. Thank you for Visiting my Blog & appreciation.